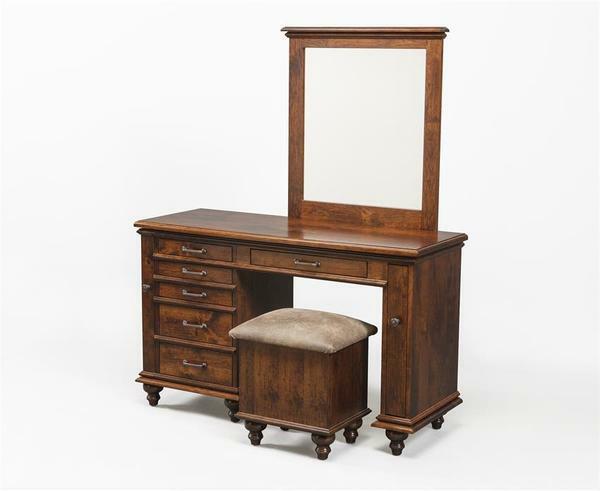 A beautiful addition to any suite, our Plymouth Jewelry Vanity combines the best of timeless good looks, and solid hardwood construction - offering a piece that is made for a lifetime of service. The combination dressing table and jewelry storage case offering eight different slide out drawers - each one crafted to store and organize your jewelry and offering easy access when you're getting ready in the morning. On top, a large surface space is also available to hold your must-have, everyday items and room to hold anything else you'll need. The included mirror is framed in the same solid hardwood and finished with a beautiful beveled edge top - offering the perfect reflection to make sure you're looking great. The optional upholstered stool offers the same bun feed and a flip up lid that expands storage space - to keep larger items out of sight and available when you need them. Customize this jewelry vanity by choosing from an array of hardwood and finish options to match your suite. The optional stool can also be customized we your favorite fabric or leather to allow you to add your personal touches to the final piece.